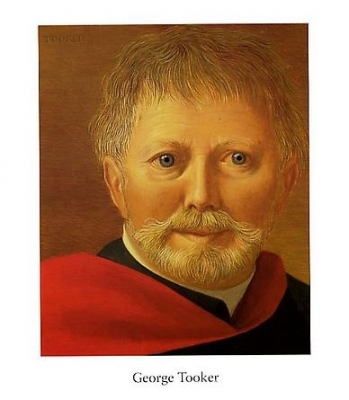 Born in Brooklyn in August 1920, George Tooker grew up in Bellport, a town on the south shore of Long Island. At age seven, he began taking painting lessons with Malcolm Fraser, a professional artist and family friend who had studied at the Académie Julian and École des Beaux-Arts in Paris. 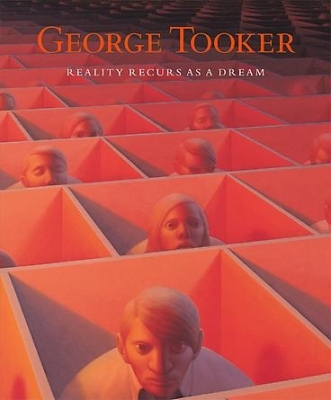 In 1938, Tooker graduated from Phillips Academy in Andover, Massachusetts, and, four years later, from Harvard University, where he majored in English literature. He did not take any fine art courses in college, but did have the opportunity to study late medieval and early Renaissance painting for the first time at the Fogg Art Museum and Museum of Fine Arts, Boston. Upon graduating in 1942, Tooker enlisted in the Marine Corps. He entered Officer Candidate School, but was soon discharged for health reasons. Returning to New York, he enrolled at the Art Students League and studied with Reginald Marsh in 1943 and 1944. He also took courses with Kenneth Hayes Miller and Harry Sternberg. 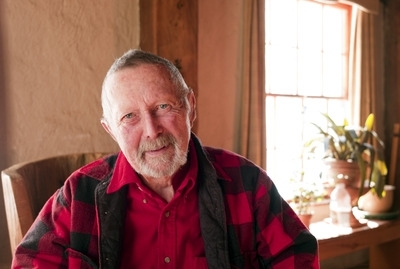 While he was a monitor in one of Marsh’s classes, he met Paul Cadmus, who in turn introduced him to Jared and Margaret French, artists who became lifelong friends. 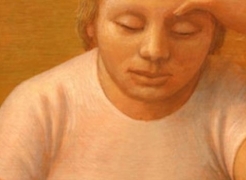 Although Tooker had begun to experiment with egg tempera through Marsh, it was Cadmus and French, in particular, who encouraged him to adopt it as his primary medium. They also introduced him to their wider circle of friends, an accomplished group of writers, composers, dancers, and artists, including Lincoln Kirstein, W.H. Auden, Christopher Isherwood, Monroe Wheeler, and George Platt Lynes. Tooker moved from his family’s home in Brooklyn to an apartment on Bleecker Street in Greenwich Village in 1945. A year later, upon Kirstein’s suggestion, he was included in Dorothy Miller’s exhibition, Fourteen Americans, at the Museum of Modern Art, which had a major impact on his developing career. In 1949, he traveled in Europe with Cadmus for six months, visiting museums, churches, and historic sites in Italy and France. 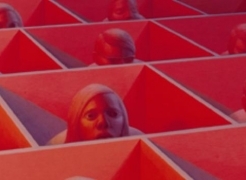 In 1950, Tooker participated in the exhibition, Symbolic Realism, organized by Kirstein, which brought him increased recognition but also resulted in his being categorized as a “Magic Realist,” a term that he never felt applied to him or his art. That same year, the Whitney Museum of American Art acquired Subway, his first painting to enter a museum collection. 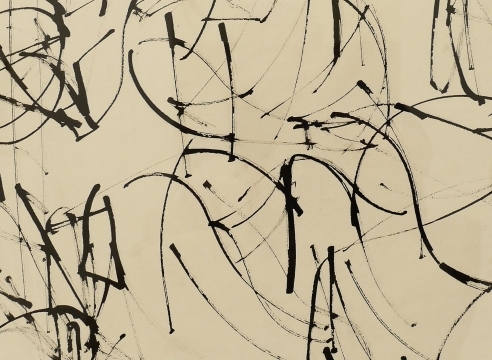 His first solo exhibition followed at the Edwin Hewitt Gallery in 1951. After a fire damaged the loft on West 18th Street in which Tooker and his partner, William Christopher, were living in 1953, they bought and renovated a brownstone on State Street in Brooklyn Heights. A rooming house across the street inspired a number of his paintings in the years that followed, including his windows series. 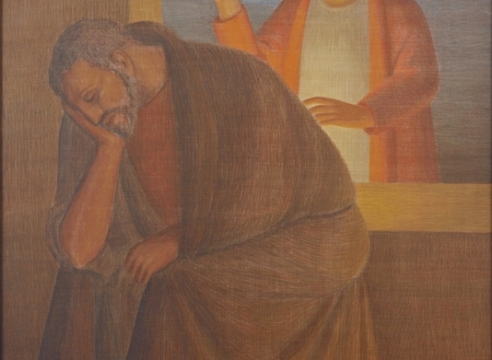 In 1954, Tooker received a commission to design the sets for Gian Carlo Menotti’s opera, The Saint of Bleecker Street, again thanks to Kirstein’s recommendation. 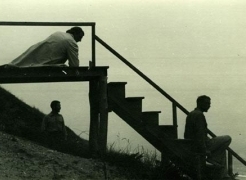 In the late 1950s, Tooker and Christopher began building a house on property that they had purchased in Hartland, Vermont, not far from Jared and Margaret French’s summer home. They permanently relocated from Brooklyn in 1960. 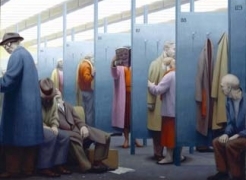 Tooker returned to New York quite often, though, and taught at the Art Student’s League from 1965 to 1968. He also continued his involvement with the Civil Rights Movement, to which he had been committed for many years. In 1965, he traveled to Alabama to take part in one of the pivotal Selma to Montgomery marches with Dr. Martin Luther King, Jr. 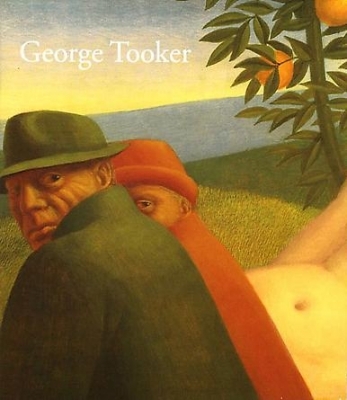 In order to escape the harsh Vermont weather, Tooker and Christopher began spending winters in Spain. They bought an apartment in Malaga in 1968, which Tooker maintained for the next two decades. A few years after Christopher died in 1973, Tooker converted to Catholicism and became deeply involved with his church in Windsor, Vermont. He painted an elaborate seven-panel work, The Seven Sacraments, which was installed in the church in 1981. In the years that followed, Tooker increasingly focused on his art and spiritual life in the relative solitude of his Vermont home. He typically followed a daily pattern of attending early Mass, returning home to paint in his studio until late afternoon, and then often sketching in the evening. In 1998, he had his first solo exhibition at DC Moore Gallery. He died at home in April 2011. Tooker had several major museum exhibitions during his lifetime, including a retrospective, George Tooker: Paintings, 1947-1973, organized by the Fine Arts Museum of San Francisco, California, in 1974; George Tooker: Paintings and Working Drawings at the Marsh Gallery, University of Richmond, Virginia, in 1989; 50 Years of Painting and Study Drawings at the Addison Gallery of American Art in Andover, Massachusetts, in 1994; and George Tooker: A Retrospective at the National Academy Museum, New York, Pennsylvania Academy of the Fine Arts, Philadelphia, and Columbus Museum of Art, Ohio, in 2008-09. He received the prestigious National Medal of Arts in 2007.